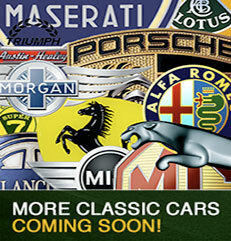 INVEST in a Classic Car ? Located in the Midi-Pyrénées, midway between Bordeaux and Toulouse in the beautiful South West region of France, we offer a select portfolio of quality British classic sports cars for sale. If you are interested in buying one of our classic cars, please call +33 (0)5 63 94 58 31 or enter your contact details in the enquiry form opposite, classic car viewing is by appointment only.